When the Case-Shiller Housing Price index was released on Tuesday morning, there was very clear picture that was once again confirmed about the housing market: Prices are moribund and nothing that the FED has done has helped. Yet, some of the media chose (as they often do) to find the one piece of information that is positive within the overwhelming negative. So, what are we to do but to listen with one ear and dig down for the real story in order to find the information that we need. 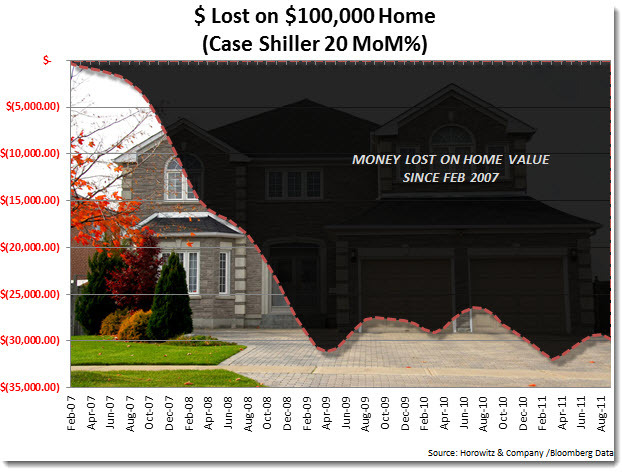 Here is a chart of the price of a house over time that reflects how much money has been lost over the past few years. Residential real estate prices dropped more than forecast in the year ended September, showing the industry at the center of the 2008 financial crisis continues to struggle. The S&P/Case-Shiller index of property values in 20 cities dropped 3.6 percent in September from the same month in 2010 after decreasing 3.8 percent in the year ended August, the group said today in New York. The median forecast of 32 economists in a Bloomberg News survey projected a 3 percent decrease. Unemployment at 9 percent, tight lending standards and a looming supply of distressed properties that may drag down home values further will probably keep hurting housing demand into next year. Sliding prices have left some people with loans that exceed the value of their properties, preventing them from boosting spending on other goods and services. Estimates in the Bloomberg survey for the price change ranged from declines of 2.7 percent to 3.9 percent. The Case-Shiller index is based on a three-month average, which means the September data were influenced by transactions in July and August. The year-over-year decline in September was the smallest in seven months. Home prices adjusted for seasonal variations fell 0.6 percent in September from the prior month, the biggest decrease since March, after falling 0.3 percent in August. Unadjusted prices also decreased 0.6 percent from August as 17 of 20 cities showed declines. Only Washington, New York and Portland, Oregon, showed gains. Atlanta, Las Vegas and Phoenix posted new post peak lows in September, the report showed. The year-over-year gauge provides better indications of trends in prices, according to the S&P/Case-Shiller group. The panel includes Karl Case and Robert Shiller, the economists who created the index. Eighteen of the 20 cities in the index showed a year-over-year decline, led by a 9.8 percent drop in Atlanta. Detroit showed the biggest year-over-year increase, with prices rising 3.7 percent in the 12 months to September. Property values in Washington were up 1 percent. Nationally, prices decreased 3.9 percent in the third quarter from the same time in 2010. They increased 0.1 percent from the previous three months before seasonal adjustment and dropped 1.2 percent after taking those changes into account. A pipeline of seized properties threatens to weigh on prices even more as a temporary halt on foreclosures stemming from faulty seizures comes to an end. In the third quarter, U.S. lenders started foreclosures on more homes, the first increase in a year, as bank moratoriums that clogged the pipeline abated. “Housing market activity remained very weak,” minutes from the Federal Open Market Committee‘s Nov. 1-2 meeting showed last week. “The large overhang of foreclosed and distressed properties along with limited demand in an environment of uncertainty about future home prices and tight underwriting standards for mortgage loans” weighed on the market, it said.